Although many still stand and recite the Pledge of Allegiance each day, many students at Sharon High School stay seated during the time designated to honor our national flag. The Pledge of Allegiance is said daily in schools across the country to instill patriotism, but students are protected by their First Amendment rights if they choose to not engage in saying the pledge. Junior Eddy Bielawa says that he stands and recites the Pledge of Allegiance every day since it contains the core ideals of what being an American entails. “America is based fundamentally in unity. The most important parts of American unity are not based in race, religion, etc. but instead are based in shared ideological beliefs. When we recite the pledge of allegiance, we are re-affirming our belief in the core tenets of America: freedom, equality, and justice,” said Bielawa. The Pledge of Allegiance was written in 1892 by a socialist minister named Francis Bellamy, who originally hoped that it would be used by citizens of any country. This pledge was not adopted by congress until 1942, when it was formally added to the Federal flag code. Senior Mickey Anchan says that reciting the pledge gives him time to reflect on the service members who gave their life for this country. “I recite the pledge not out of blind obligation but more so out of purposeful respect for this country,” said Anchan. Anchan adds that he understands some of the reasons why people do not stand during the Pledge of Allegiance. “Some of my friends are actually not Americans. They are Canadian citizens or Indian citizens, or they are not naturalized citizens so they do not stand,” said Anchan. Anchan says he has a great love for our country. “Being a child of immigrants, this country has afforded my family more than we could possibly imagine,” said Anchan. “I decide that that 30 second period in the morning for me is a nice time to reflect and also say a prayer for this country and to the direction for which I hope it goes,” Anchan added. Senior Dana Jaffe is one of many students at Sharon High School who say they will always stand for the Pledge of Allegiance but do not necessarily recite it every day. “For me, I see it as respect for America and even when I’m not always proud of what’s going on in our country. I am grateful that I live here and have so many opportunities,” said Dana Jaffe. Originally, the Pledge of Allegiance read: “I pledge allegiance to the Flag of the United States of America and to the Republic for which it stands, one nation, indivisible, with liberty and justice for all.” In 1954, President Eisenhower encouraged congress to add the words “under God” to the pledge in response to the Communist threat during the Cold War. Sophomore Sam Levitt says that he went to Jewish private school, so it was not something that he grew up with in his daily school routine. “ I’m not against it and sometimes put my hand on my heart to show respect but almost never recite. I sometimes touch my Jewish star necklace to think of the Jewish people and Israel,” said Levitt. Junior Arnav Joshi says that he does not say the pledge everyday out of laziness and conformity because he feels that it would be awkward for him to be the only person in the class reciting it. Senior Raga Chilakamarri says that even though she does stand for the pledge, she mostly aligns with the people who choose to stay seated in support of people who aren’t properly represented in our country. “I guess it’s so ingrained as a habit that I don’t think much of it,” said Chilakamarri. The Massachusetts government requires the Pledge of Allegiance to be led in group recitation in every public school. 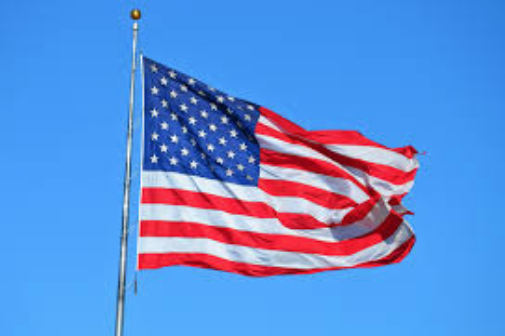 However, in the West Virginia Board of Education v. Barnette 1943 court case, the Supreme Court ruled in favor of protecting students’ rights to not participate in pledging allegiance to the flag. Junior Thomas Wilson belongs to the group of students who purposely sit during the Pledge of Allegiance everyday. “I feel like the government is no longer trying to do what is best for the people, but they are doing what is best for the rich white man. The people are still fighting hard for their liberty and the innocent are definitely not getting justice,” said Wilson. Senior Ren Dominguez says that they don’t stand for the pledge for their own personal reasons. “I sit and don’t recite for a lot of reasons, most of which stem from my distrust toward any kind of authority,” said Dominguez. Junior, Gabe Miller-Trabold began questioning the pledge in third grade. “I chose to start sitting because I didn’t agree that there was liberty and justice for all, especially because at the time gay marriage was still illegal. Also, the racial inequality that still exists between police brutality where the officers receive no punishment and the white supremacy marches that our president refuses to condemn make me still feel that there is not liberty and justice for all,” said Miller-Trabold. Miller-Trabold also says that he does not agree with pledging allegiance to a country regardless of its decisions, but rather to uphold the values of that country. “I think pushing our country to do better and making sure it is living up to the best it can be is the most patriotic thing you can do,” Miller-Trabold added.